you can change it in /conf/config.php. Note: if you change to a different InputFormatter in the config.php, it will only affect NEW posts. If you use Buttonbar plugin - your current InputFormatter will be reflected in a message in Post Box. - 21 Help! I don't know css or how to change it. you can change the css in the custom.css in the design folder of your theme. you can add rules and change rules. if you make css changes and have problems seeing the changes working, maybe it is due to caching or cloudflare then try this link for info and turn off caching and cloudflare or use the cssedit plugin. try this theme for experimentation and learning. some have learned by reading css tutorials, you can too. also see these links which will be very helpful after you reviewed some of the tutorial links above. you can google "firebug tutorial" or "inspecting css tools"
.htaccess is a hidden file in the root of your vanilla forum folder. # Certain hosts may require the following line. # If vanilla is in a subfolder then you need to specify it after the /. and it would look like this with changes. if you still have problems, your apache server may not be set up with rewrite. so mod re-write enabled in apache. or create a phpinfo.php file with these lines in it and run from browser. - 23 How do I change the maximum size for file uploads, pictures, etc ? However, there may be a limitation set via php. the smallest setting from setting php or from the conf/config.php is the maximum allowed upload size. i.e. if php shows upload_max_filesize = 2M and your config statement is $Configuration['Garden']['Upload']['MaxFileSize']= '8M'; You are still limited to max 2M. - 24 How do alllow other file extensions allowable for upload? e.g. I want to allow uploads of mp4 files. anything in the array above is allowed you can add other file extensions to the array. add any extensions you want to allow to the array. - 25 How can I stop spam (or at least reduce it) and report it? What about stopping Spam Applicants? Depending on your needs a combination of the plugins below, may reduce the impact of spammers. You can use "Report Spam" plugin, which lets you delete & ban. Akismet plugin - Akismet spam protection integration for Vanilla. you can also use applicant approval registration method. remove permission in that role for viewing activity and profile. for cleaning mass spam applicants, etc. - 26 How do I allow users to flag or report posts and receive an email notification that a post has been flagged. enable the flagging plung that comes with the vanilla core distribution. you can also add this to other roles perhaps moderator. 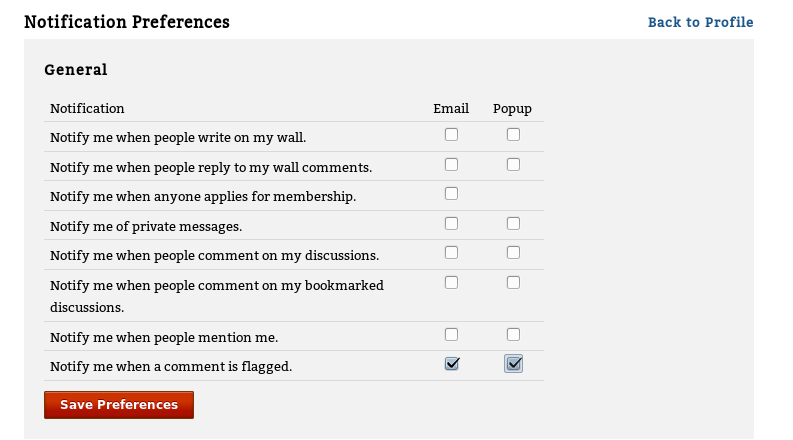 next edit your profile, then select notification preferences, you will see a new notification preference. check what preferences you want. - 27 Where is the official documentation for vanilla forums? Why should I read it? You can see a link for Documentation on the top menu bar of this forum! Reading the documentation can help you). It give you insights about Vanilla. It can be really helpful to skim it, scan it, read it, peruse it! if you are using the open-source version of vanilla, meaning you are hosting vanilla yourself, check out the links relating to open source, Developers, Themes, and Features. if you click on developers it give you insights on many aspects of the open-source configuration, etc. - 28 How to change order ( position ) of items in side panel, modules and How to change order of menu items. - 29 What are some basic troubleshooting steps? Got a mysterious problem occurring. But can't figure out if it is theme or plugin or core or database structure related. A ) run /utility/update and /utility/structure to update structure of database. B ) Have you recently changed theme or added css files or added a locale or created new definition files? delete the .ini files in /cache folder. getting a bonk or blank page after changing themes. check the permission on your Smarty/compile folder and make sure it exists. C ) other mysterious issues. if problem still occurs, download core files again. if problem still occurs (no plugins and default theme) , file issue on github. if problem is fixed - you made a change to core that caused the problem. D ) if you see a blank page (or something has gone wrong page). Remember to remove the config statement or change it to FALSE, when you are done. tip: always good to enable plugins via dashboard instead of modifying config.php. - 30 Addendum to troubleshooting steps for item 29.
if your upgrade fails or you have mysterious issues. and mention that you have them if posting on the forum. If any of the replies are out of date or you can improve on them, please do, and let us know on here, so we can edit them. If you regularly answer questions, and a FAQ isn't on here, please add it. Bumping this !! It is still very relevant today... @whu606 can you remove the necro tag ?